Kirsten started teaching yoga in 2006 after discovering yoga in college. She has completed several workshops and trainings, including hot and prenatal yoga trainings and her 200-hour teacher training from Bhava Yoga Studio in Albuquerque, New Mexico. She has experience teaching Hatha, vinyasa, yin, hot, prenatal, and restorative yoga classes and working with students with varying levels of experience and practice. Kirsten believes that yoga is for everyone. 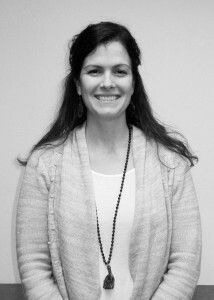 She enjoys teaching because she sees how yoga impacts and transforms the lives of its students. Each of her classes combines the flow of movement with the flow of breath to cultivate flexibility and relaxation. She finds joy in creating balanced and personalized practices to create space in and unity between the body and the mind. Kirsten holds a bachelor’s degree in Chemistry and Anthropology and a Master’s degree in Anthropology-Archaeology. She currently works for Northern Arizona University and enjoys spending time with her husband and two young children hiking, camping, and exploring the Colorado landscape.